The Dividist Papers: End Game: The face of "Victory in Iraq"
End Game: The face of "Victory in Iraq"
Good News / Bad News. The good news is that we have entered the "End Game" of our military involvement in Iraq. The bad news is that the man making the smart moves on the chessboard is Moqtada al-Sadr, likely future leader of Iraq, and the face of "Victory in Iraq" as defined by United States policy. To be clear, this is a prediction and not a preference. I dearly hope to be wrong about this. Few in the U.S. would be happy about a Moqtada al-Sadr led Iraq. Nevertheless, it may be the best least bad outcome that we can expect and, believe it or not, is completely consistent with the administration's continually evolving definition of “Victory.” Make no mistake, al-Sadr is a consummate politician. Like Republicans railing against "defeatocrat" Democrats, like Democrats railing against "war-mongering" Republicans, al-Sadr will rail against the "The Great Satan" America to play to his base of support. And like Republicans and Democrats, he will work with his opponents to achieve his personal ambitions for power. I'll return to why I think an al-Sadr "End State" is a likely outcome later, but first we need to talk about some words. Specifically the words "victory" and "defeat", "win" and "lose", "success" and "failure" in the context of our military involvement in Iraq. Harry Reid says "this war is lost", but is unable to clearly explain exactly what he means. In his State of the Union speech, George W. Bush lectured Congress that "nothing is more important at this moment in our history than for America … to succeed in Iraq" continuing with the admonition "whatever you voted for, you did not vote for failure." More recently, he said "Setting a deadline for withdrawal is setting a date for failure", but while he warns about the dire consequences of failure, he has been unable to clearly explain to the American people exactly what it means to achieve victory. Bloggers on the right and left, Republican and Democratic presidential hopefuls, columnists and pundits weigh in on whether the war is won or lost, how to achieve victory, how to avoid defeat, who will take the credit, or who will be blamed. 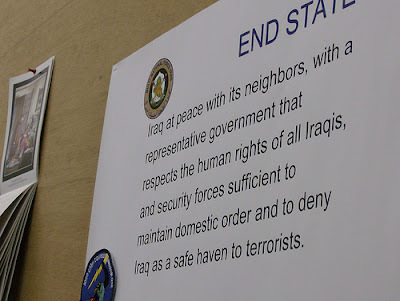 The problem is not that there is a dearth of Iraq End State descriptions. The problem is that there have been too many, and there is too much ambiguity about which specific End State is the explicit goal of US policy. Imprecise? Yes. But the goal of leaving is explicit. Perhaps I am grasping for straws. To the degree that Iraq is a viable country (To Be Determined), it is their country, not our country. Iraq enemies and friends alike, live there, we don't, and therefore they will outlast us in Iraq. How could it be otherwise? As President Bush said, the Iraqi’s will decide the form of their government. How long it is “necessary” for us to stay, and what Iraq will look like when we leave remains an open and legitimate question. And therein lies the honest debate: What is the end-state and how do we get there? CHRISTIE: Let me push back and disagree with you, Chris. We‘re there now. One of the things that I find most distressing of what you hear in the media is our troops are over there. Our people are in harm‘s way. Let‘s talk about how we‘re going to win this thing, Chris. MATTHEWS: But nothing that‘s happened over there was not predictable. Gene, what‘s the surprise? I keep waiting for somebody to tell me what‘s happening over there is surprising. It is consistent with the regional history. ROBINSON: It is consistent with the history of, you know, this patch of Mesopatmaia that is called Iraq, but is not really a polity of a nation that holds together. What is—what—maybe this will cause people to ask the question that I‘ve been asking all along, which is, at this point, what is victory in Iraq? MATTHEWS: Let me ask you this: maybe this is race; maybe this ethnicity, but do you really think we would have dared go back into Yugoslavia after the end of the Cold War and insisted that all those countries that are now independent sovereign states rejoin each other and become Yugoslavia again. We wouldn‘t presume to do that to a European country. We would allow self-determination to be the natural order of things in Europe. So why are we doing it in the Middle East? Why are we presuming, as Westerners, that we can go into a country that doesn‘t feel like a country and dictate their political organization? Anyway, thank you Gene Robinson. Ron, you and I are getting Closer. CHRISTIE: No, we‘re not getting closer. We've got to win this war. I'll tell you when we are going to win it Ron - when this administration stops the mindless sloganeering and explains to the American people exactly what "Victory in Iraq" really means. This post strives to analyze relevant original source material in an effort to gain a real understanding of what “victory”, “defeat” and “End State” in Iraq mean today - in mid-surge, May, 2007. There are exactly two meaningful sources to define these terms and to explicitly understand the target End State. One source is the Commander in Chief that set the policy and specified the mission that committed our military to this action, and the other is the military commander responsible for executing that mission. In this quest, President George W. Bush and General David Petraeus are the only sources that matter. Q: Mr. President … you talk about victory, that you have to have victory in Iraq; it would be catastrophic if we didn't. You said again today that the enemy would come here, and yet you say it's not an open-ended commitment. How do you square those things? THE PRESIDENT: "You know, victory in Iraq is not going to be like victory in World War II. It's one of the challenges I have to explain to the American people what Iraq will look like in a situation that will enable us to say we have accomplished our mission. First, the -- Iraq will be a society in which there is relative peace. I say "relative peace" because if it's like zero car bombings, it never will happen that way. It's like -- the fundamental question is, can we help this government have the security force level necessary to make sure that the ethnic cleansing that was taking place in certain neighborhoods has stopped. Look, there's criminality in Iraq, as well as the ethnic violence. And we've got to help the Iraqis have a police force that deals with criminals. There is an al Qaeda presence in Iraq, as you know. I believe some of the spectacular bombings have been caused by al Qaeda. As a matter of fact, Zarqawi -- the terrorist Zarqawi, who is not an Iraqi, made it very clear that he intended to use violence to spur sectarian -- car bombings and spectacular violence to spur sectarian violence. And he did a good job of it. And so there -- and then there's this disaffected Sunnis, people who believe that they should still be in power in spite of the fact that the Shia are the majority of the country, and they're willing to use violence to try to create enough chaos so they get back in power. "Victory will come when the terrorists and Saddamists can no longer threaten Iraq's democracy, when the Iraqi security forces can provide for the safety of their own citizens, and when Iraq is not a safe haven for terrorists to plot new attacks on our nation." An Iraq that is a partner in the global war on terror and the fight against the proliferation of weapons of mass destruction, integrated into the international community, an engine for regional economic growth, and proving the fruits of democratic governance to the region." Problematical undefined terms in this definition include: “steady progress”, “key economic reforms”, “an inspiring example to reformers”, “defeated the terrorists”, and “proving the fruits of democratic governance” among others. In reality, everything beyond the first stage “short term” definition is flowery rhetoric, and while a noble statement of hope, completely useless as benchmarks to guide our military participation. ” It is easier to separate an insurgency from its resources and let it die than to kill every insurgent. Clearly, killing or capturing insurgents will be necessary, especially when an insurgency is based in religious or ideological extremism. However, killing every insurgent is normally impossible. Attempting to do so can also be counterproductive in some cases; it risks generating popular resentment, creating martyrs that motivate new recruits, and producing cycles of revenge… As the HN government increases its legitimacy, the populace begins to assist it more actively. Eventually, the people marginalize and stigmatize insurgents to the point that the insurgency’s claim to legitimacy is destroyed. However, victory is gained not when this isolation is achieved, but when the victory is permanently maintained by and with the people’s active support and when insurgent forces have been defeated… In the end, victory comes, in large measure, by convincing the populace that their life will be better under the HN government than under an insurgent regime. " - Pages 37 –38. Provide reasonable levels of security from external threats while not threatening regional ecurity. Provide reasonable levels of internal security without infringing upon the populace’s civil liberties or posing a coup threat. Be founded upon the rule of law. Be sustainable by the host nation after U.S. and multinational forces depart. 3) SECULAR STRONGMAN – FRIENDLY: A secular strongman allied to/coopted by the US and capable of imposing security and creating stability in Iraq (A US supported Military Coup “keep the toothpaste in the tube” no sectarian violence/civil war end-state). 4) DEMOCRATICALLY ELECTED ISLAMIC FUNDAMENTALIST LEADER – ACCOMODATIVE: A democratically elected sectarian Islamic fundamentalist leader capable of providing security and stability for Iraqis and an accommodative but arms-length relationship with the U.S. (The Moqtada al-Sadr end-state Option A). 5) SECULAR STRONGMAN - HOSTILE: A secular strongman indifferent/hostile to the US but capable of imposing security and creating stability in Iraq (The Saddam Hussein end-state. Been there. Done That ). 6) PARTITION: Iraq broken up into two or three nation-states, maybe federated, maybe not, which presumably would each independently evolve into one of these other end-states. Perhaps each winds up better, perhaps worse. This may or may not actually be a distinct option, as each partitioned state would default to one of the other choices. The only real benefit, is that at least the Kurdish Sate would make Option 1 or 2 available again for that state – if it is not over-run by Turkey. 8) VIOLENT COLLAPSE: The collapse of Iraq society into warring sectarian factions, war-lords, and un-controlled violence, massacres, “ethnic cleansing”, and all out civil war a/la Somalia. Those are all the possibilities for an end-state. Take your choice, then we can talk about “winning” or “losing” that particular state. If you choose 1, then Harry Reid is correct. We lost. Choose 8, then George Bush is absolutely right when he says we cannot afford to lose. Here is my take. One and two are eliminated as realistic possibilities, because neither the Bush administration nor David Patreaus is talking like those are objectives any more. Number 3 has been, and probably still is discussed both here and in Iraq. It might be the actual infamous "Plan B” that nobody wants to talk about. Number 8 is regularly invoked as a bogeyman to justify the current course of action in Iraq. Clearly, we cannot allow number 8 to happen, but there is no reason to assume that it is an inevitable or even probable outcome, even if we were to leave precipitously, a course that no one is advocating. The Iraqi’s would find number 7 preferable to eight, so even in a power vacuum left by an unlikely precipitous US withdrawal, number 8 is still a highly unlikely End State. The most likely End State scenario is an “accommodated” (or if you prefer “co-opted” or “bought-out”) Moqtada al-Sadr, or someone just like him. A popular theocrat, elected into leadership in Iraq, still railing at the “Great Satan” from his bully pulpit, but behind the scenes working with the US at the precise intersection of US interest in a stable Iraq, and his lofty personal ambition for power on a world stage. Strange bedfellows indeed. This photo from the office of Rear Admiral Fox was taken by RedState blogger Jeff Emanuel, during his recent trip to Iraq. This is a nicely distilled fusion of both documents linked above. It shows that our military does talk about Iraq in terms of victory or defeat, but in terms of End State. Note that there in nothing in this End State Mission Statement that precludes a Moqtada al-Sadr led Iraq, as long as al-Sadr chooses to play along. TO BE CONTINUED: In the next (and concluding) post of this series, which I hope to complete early next week (operative word being "hope"). We’ll explore why it is likely to be specifically Moqtada al-Sadr that ultimately takes the reins in Iraq (assuming we don't kill him first). Net net, this is a case where it is literally true that “What does not kill you, makes you stronger.” We missed opportunities to kill al-Sadr in ’03.’04, and ’05. Now the United States is likely to be both the agents of and reason for his emergence as the most powerful man in Iraq. If you can’t wait for my analysis, you may want to check out Stormwarning’s Counterterrorism blog. While I don’t always share his perspective, he has been following, thinking, and writing about al-Sadr longer than most and my thinking was shaped by his work, examples in posts linked here, here, here and here. If you enjoyed it, Vote for this post at Real Clear Politics. Technorati tags: divided government, Harry Reid, Iraq, George Bush, Democrat, Republican, Muqtada al-Sadr, David Petraeus. MW, thanks for the links. We can't always agree, but when it comes to al-Sadr, I believe that we once again "misunderestimated" his influence. We'll end up paying for that. Yup. Moqtada al-Sadr may yet prove to be the Republican party's best friend. If he is able to force though a vote in the Iraq parliament calling for a US timetable for withdrawal, it will give Republicans political cover to distance themselves from GWB and align with the majority of Americans on Iraq. I think a lot of assumptions are being made here based purely on how media wants it to be perceived. And yeah, that debate you cited, along with most of the media debates presented, are meaningless as they have no more of a reason to be cited than I. There have been a few meaningful ones, but they weren't on MSNBC. They won't allow one. Since so many people are ceding their well-being and the possible security of planet Earth to MSNBC and Chris Matthews, what are they going to do to make things safer for us? That's the question people like Harry Reid won't answer, and MSNBC won't ask. Reid et al harp on the things that were not in Iraq, but they are much quicker to dismiss what WAS in Iraq. And, to some degree, is now coming INTO Iraq. If we just cut tail and run, what will Reid and Pelosi do about all that stuff? They knew it was there, they know it's there now. What are they going to do about all the IED's, chlorine gas bombs, heavily armored Iranis, Pakistanis, Al-Qaeda, etc. Especially in light of the that fact most of those groups want us dead? What are they going to do about it? It's easy to criticize, it's a hell of a lot harder to answer the specific questions. Especially if you know your answer is wrong. The end game IMO, is when we feel Iraq is no longer a threat to us. If we leave before that end game is realized, we'll have to go back again. That's the only political scenario Harry Reid is offering us. 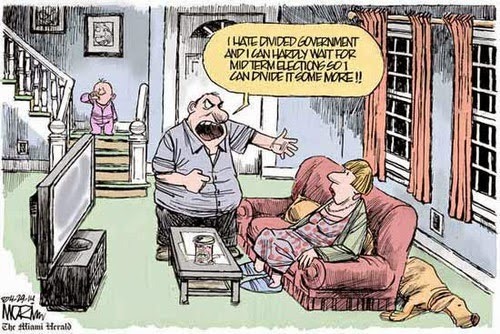 That is the only scenario "most Americans" are insisting on. We declared WWI was over before it actually was, it led to WWII. We declared WWII over before it actually was, that led to Korea and Vietnam. Which lesson are people referring to when they want to just cut and run that assures we won't be drug right back into it? To use the word "articulate" with reference to anything issuing from this g.w. shrub's maw constitutes the grossest misuse of the English language. He cannot even read the simplest of speeches written for him at a sixth grade level. If you read my statement, you will see that I am making a relative comparison, and I am comparing one GWB speech to another. In that context it is perfectly correct to say that "the President was more articulate and succinct" in one example vs. himself in the other. Beyond that, you are simply wrong. In fact, the President can very effectively "read the simplest of speeches written for him at a sixth grade level." Well, yes there are "assumptions" here - In the third sentence of the post I said this was a "prediciton" which, almost by definition, means I am making assumptions, or extrapolations based on a variety of sources. My primary sources for definition of "victory" is 1) the official document and speeches of The civilian Commander in Chief, and 2) The Counterinsurgency manual written by the Military Commander on the ground in Iraq. I don't think you have to invoke a media conspiracy to recognize what Moqtada al-Sadr is. Your co-blogger Sormwarning recognizes it, and his analysis informs my extrapolations. 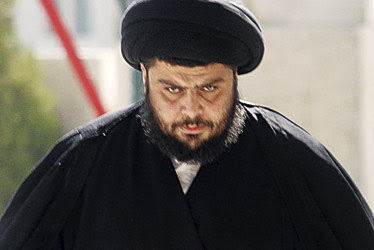 Moqtada al-Sadr is a garden variety, very ambitious, power hungry politician. Perhaps smarter and craftier than most. He wears a religuous fundamentalist cloak to secure the support of his political base, not unlike Republican Presidential candidates will change their views on abortion or deny evolution to secure the support of religous fundamentalist constituency. 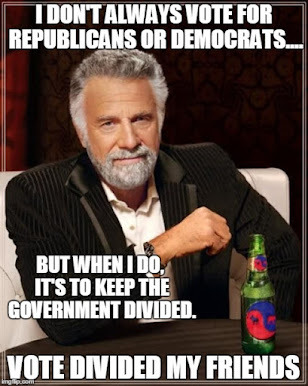 Or like Democrats will kow-tow to Unions and pro-life groups to secure the support of their constituencies. It is not clear to me that anything that has happened in Iraq is making things safer for us. Al Queada was not there before our incompetent occupation, but they are there now, and continue to grow in influence in Iraq under our security watch. It is not at all clear whether our presence there creates terrorists and enemies faster than we can kill them. Strawman. About the same percentage on the left advocates a preciptous "cut and run" as the percentage on the right that advocates turning Iraq into a nuclear parking lot. Neither is a realistic probability so there is no point in arguing against something that has no real political support and no liklihood of happening. I can ask the exact same question of this administration. What are they going to do about it? Because every single thing you mentioned did not exist as a problem in Iraq until we took over the Security of the country. And every year that we have been handling the security of the country, all of the problems you mention have gotten worse. Every single year. Under our watch. What are we going to do about it? I have outlined in this post every possible end-state that I can think of, and through the process of eliminating those that are no longer viable (mostly due to the incompetence of the occupation), I arrive at a conclusion of what we are going to do about it. That is the prediction/extrapolation I outline in this post. An elected Moqtada al-Sadr sufficiently supported by the US to quell the insurgents in his country looks the the best of the bad choices remaining to us. We are going to find a way to leave, becasue the president said we were going to find a way to leave back in 2003, and the American people are going to hold him to that. Pretty general statement. In fact, almost useless as a benchmark. Both Bush and Petraeus have said we can never get the car bombings to zero, and we can never kill all the insurgents. So I am not sure what benchmark you use to decide that Iraq is no longer a threat. Perhaps what you are advocating is a premanent presence and continuous war in Iraq. "If we leave before that end game is realized, we'll have to go back again." Right. Sort of. It is certainly a possibility we would have to go back. But given the mushy nature of your criteria for leaving, it will always be a calculated risk of how much of threat Iraq represents for anything short of the nuclear parking lot endstate. Of course, we won't know if it will work, unless we do leave and find out. Again I don't understand what you are advocating, unless it is a permanent military occupation of Iraq. Thats one way of making sure we never make the mistake of leaving too early and having to go back. Just never leave. No problem. "That's the only political scenario Harry Reid is offering us." And EXACTLY what political scenario is George Bush offering us? As i said before, that assurance is impossible under all scenarios short of killing everyone in the country. It is a bad criteria. Leaving will always be a calculated risk. It is a criteria that requires us to never leave.